Molecular biomarkers are becoming increasingly attractive in drug development programs for muscle diseases especially for Duchenne muscular dystrophy (DMD). Robust and validated blood and muscle biomarkers that are sensitive to drug treatment (e.g., pharmacodynamic biomarkers) and that can predict later clinical outcomes (e.g., surrogate biomarkers) will likely aid in developing effective therapies for DMD at several levels. Peripheral blood biomarkers can serve as more objective and acute readouts of drug effects relative to clinical outcome measures. Furthermore, they may minimize the burden on patients and families regarding participating in trials and can help with go-no-go decisionmaking at early stages of drug development possibly reducing the length and cost of the clinical development program. Lastly, they may provide insights into pathobiochemical pathways and help define novel therapeutic targets. 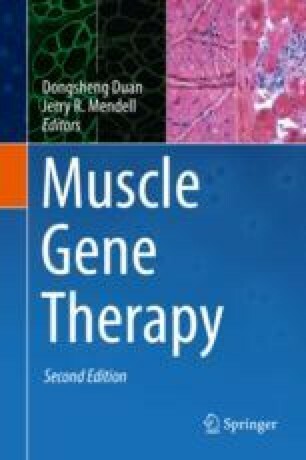 In this chapter, we will focus mainly on molecular biomarker advances in DMD with the emphasis on their utility to assess efficacy of gene therapy in this disease.